Troop 55 - On The Move! Welcome to Troop 55's website! We are a Scout Troop serving both boys and girls located in Santa Rosa, California. Our goal is for this website to provide the best and most up-to-date information on what is going on with our troop and to improve and facilitate communications. Troop 55 members: Please login using your user name and password. If you have forgotten your login information, please use the Contact Us link to request your username and a new password to be sent to you. 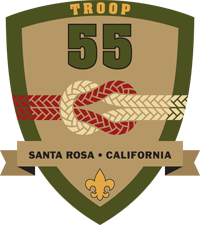 Guests: If you are interested in learning more about Troop 55, please click on the About Troop 55 or Contact Us links. Thank you for your interest in Troop 55! Please send any feedback about this website by clicking Contact Us on the left side of this page and filling out the form. Troop 55, On The Move!